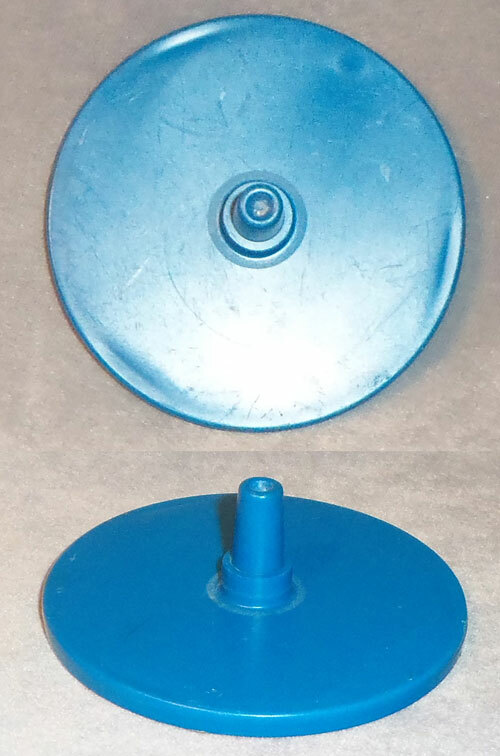 Description: Round dark blue plastic ride base with an upright peg in the center of one side. The Flying Dumbo and Revolving Teacups fit on top of this base to spin. Bottom is marked, "PT. NO. 143643, ©1977 HASBRO®". Measures 1" tall x 3-1/4" diameter. 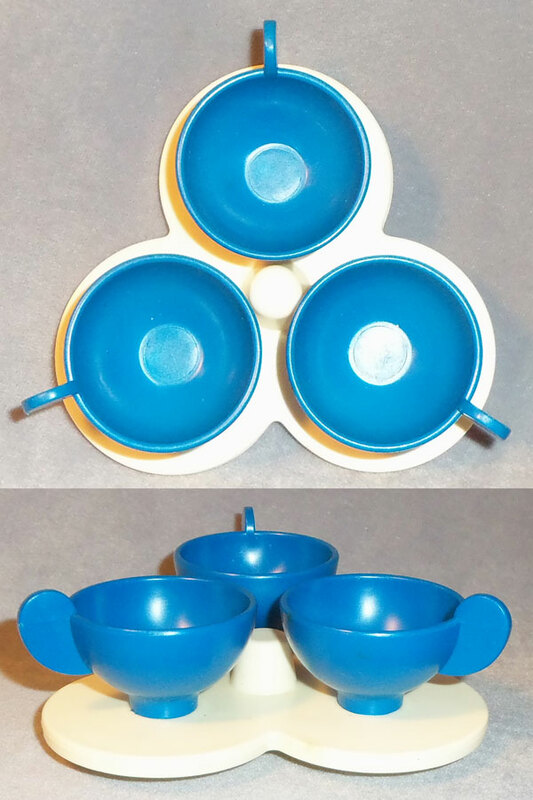 Description: 3 BLUE (dark blue) coffee cups with a handle on the side (handles pointed outward from center), and cups sit on WHITE saucers (molded/merged together). 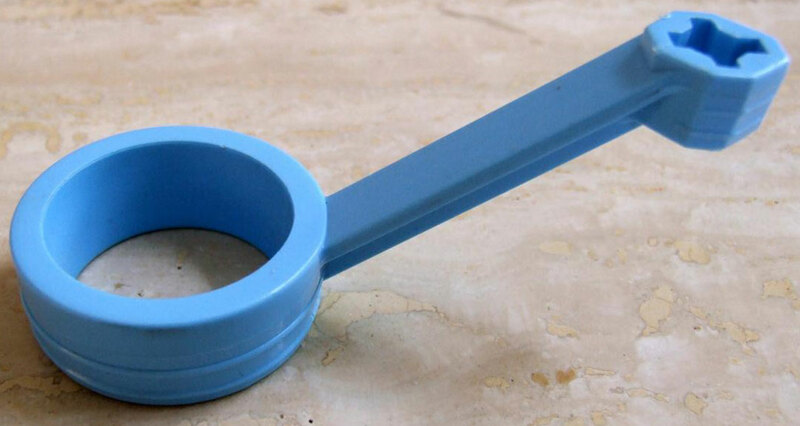 The center of the saucers case has a raised round peg, and a hollow pole on the bottom. The teacup ride fits over a round support base, allowing the ride to spin. Bottom marked, "©1977, HASBRO®, PT. NO. 143642". Measures 1-1/2" tall x 4-1/4" diameter. Also see HTW288 WHITE coffee cups on BLUE saucers. 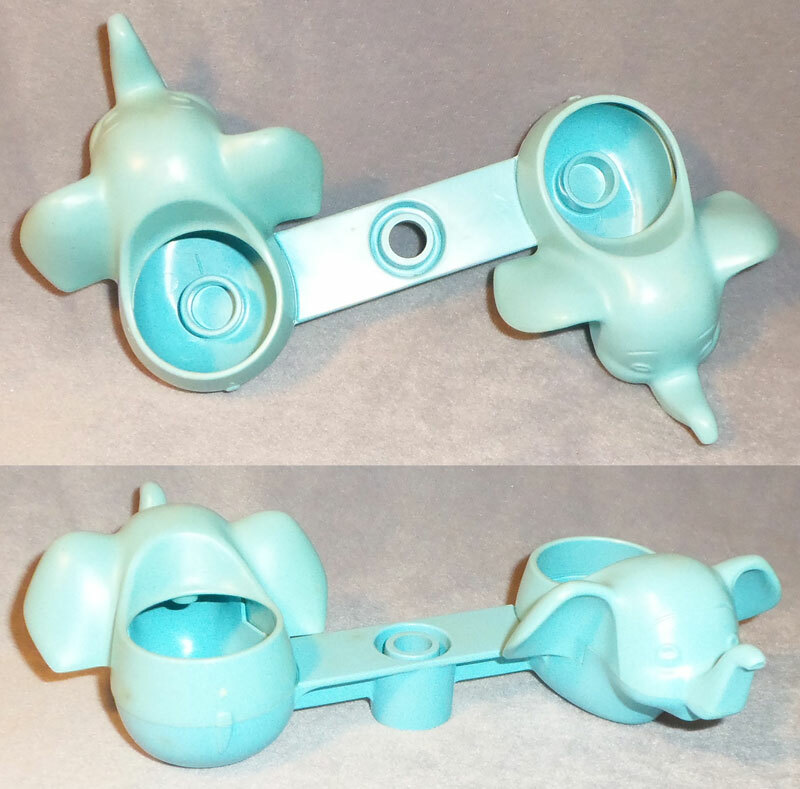 Description: 2 light blue hollow Disney Dumbo "rides" attached via rectangular bar with a hollow peg in the center. The peg fits over a round support base, allowing the ride to spin. The peg also fits over the flag poles (when attached to the Magic Kingdom base) and spins on the flag pole(s). 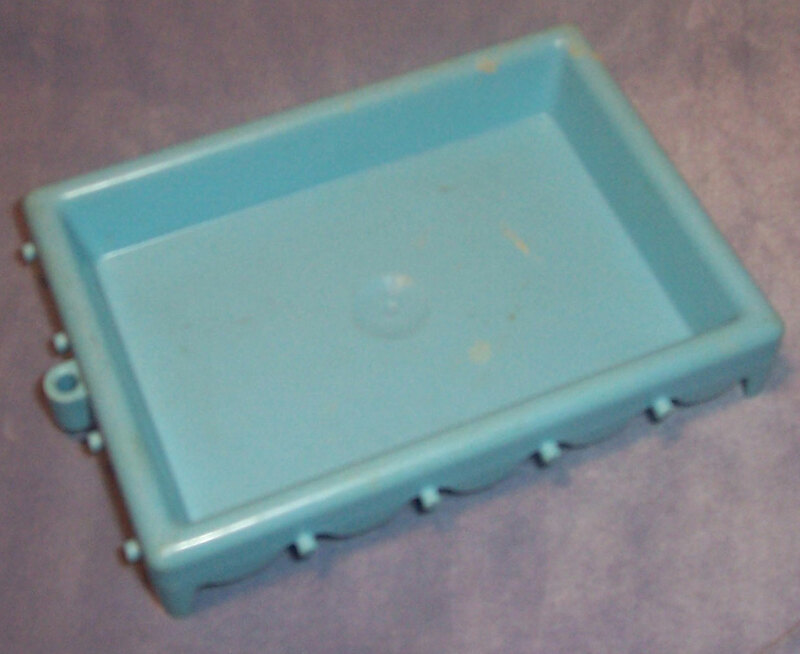 Bottom of center/connecting bar marked, "HASBRO®, ©1977, 143636". Measures 7" wide x 1-3/4" tall x 3-1/2" deep. 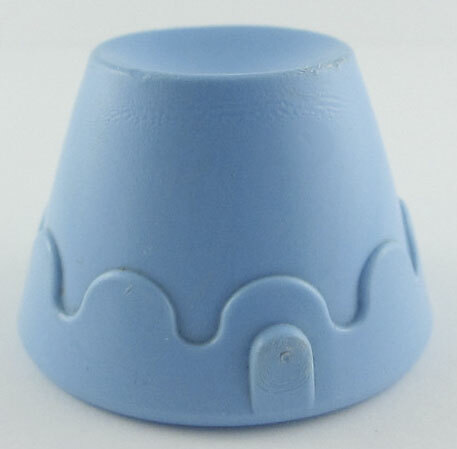 Small light blue thimble-shaped ringmaster pedestal stand. Has a wide round base with a small round top (recessed circle on top for Weeble figure to fit onto). Sides of pedestal has scalloped design. Measures 1-1/2" diameter. 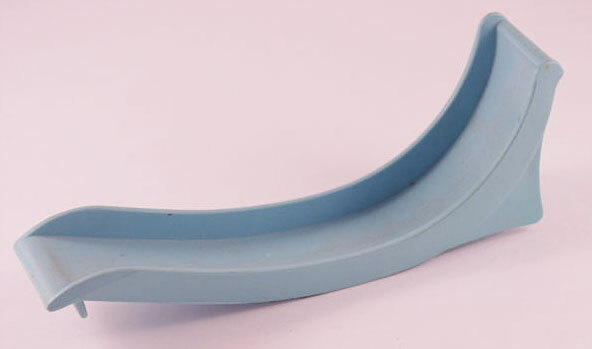 Blue plastic pole with a small loop on one end (flag pole fits within + shape in the loop), and a large loop on the other end (Weeble figure sits within the large loop). 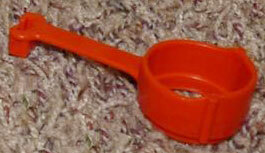 Description: Small red plastic ring with an arm on one side. The arm has a squared end piece that attached to the monorail platform pole. Bottom of arm marked, "143630, 2". Measures 3-1/4" long x 1-3/8" wide. 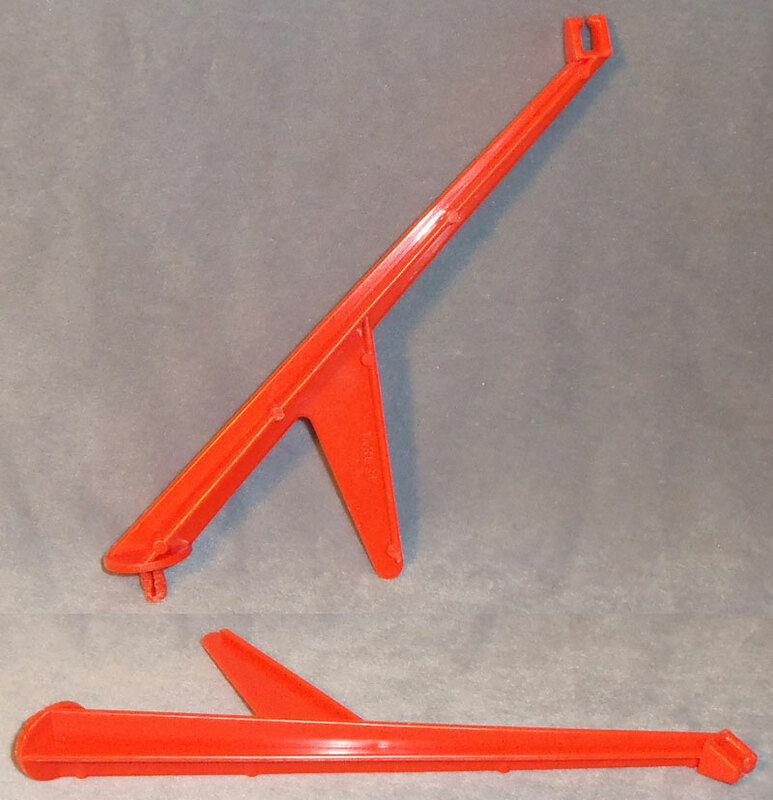 Description: Red monorail support pole with a small squared "clamp" on one end (to attach monotrail track) and a round tilted disc on the other end. 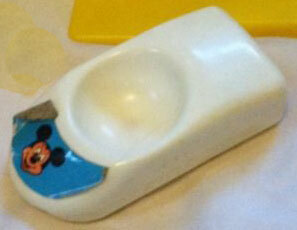 The disc has a small round peg on the bottom to attach to one of the support post holes on the Magic Kingdom base. The side of the pole (disc end) has a triangular support arm/tab to help the support arm stand upright. One side of the triangular support arm is marked, "143631 - 2". Measures 7-3/8" long with 2-1/2" long triangular support arm. Description: Tall red t-shaped pole with a rectangular platform on one end. Has a cross-shaped hollow "peg" under the platform (to attach monorail track). One side of rectangular platform is marked, "143876 - 2". Measures 11-5/8" long pole with 2-1/4" long x 1-1/2" wide platform on top. 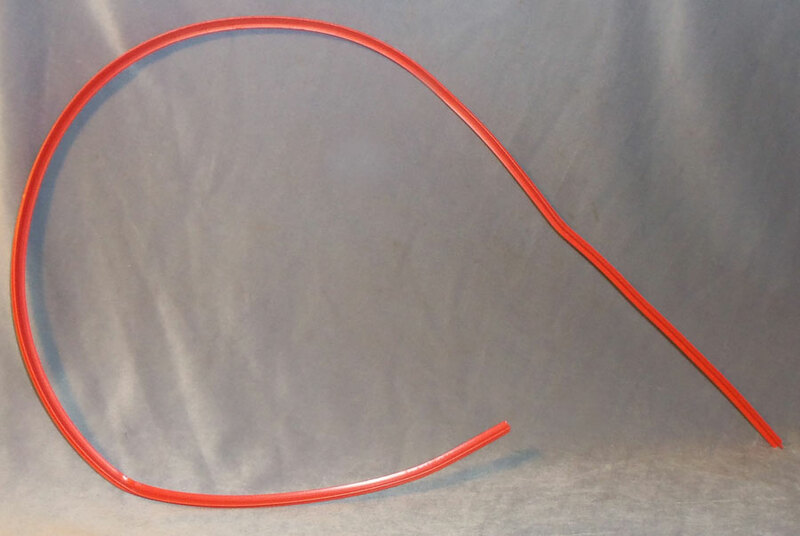 Description: Long t-shaped red flexable monorail track. Thin red plastic ring with a short "arm" on one edge. The end of the "arm" has a small peg to attach the hoop to the circus center stage or to the trampoline. 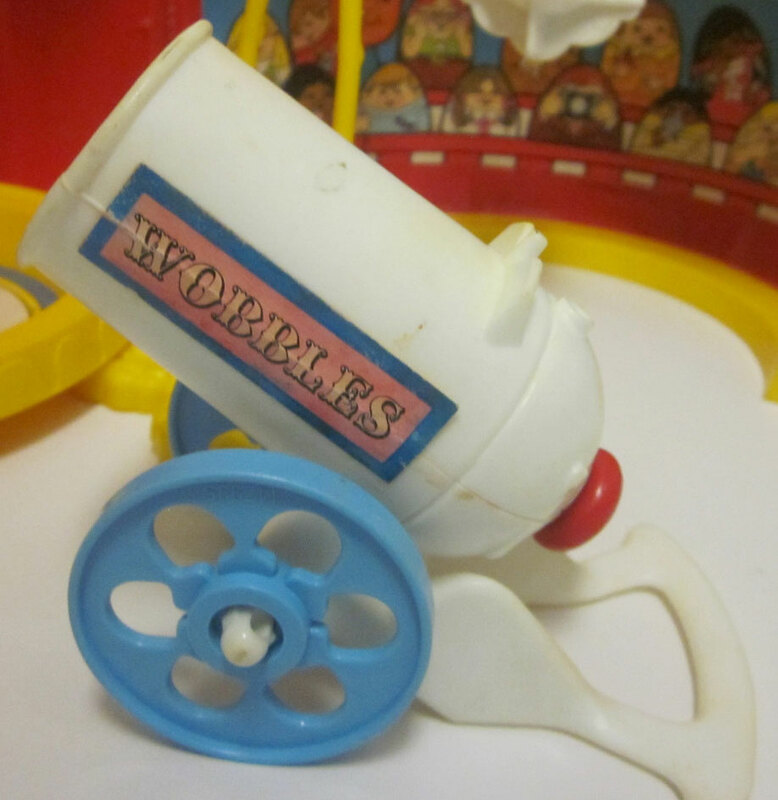 White plastic cannon with 2 light blue wheels on the sides. Each side of the cannon barrel has a red rectangular litho with a blue edge and "Wobbles" in yellow. The back of the cannon barrel has a red button (to shoot Weeble figure out of the cannon). 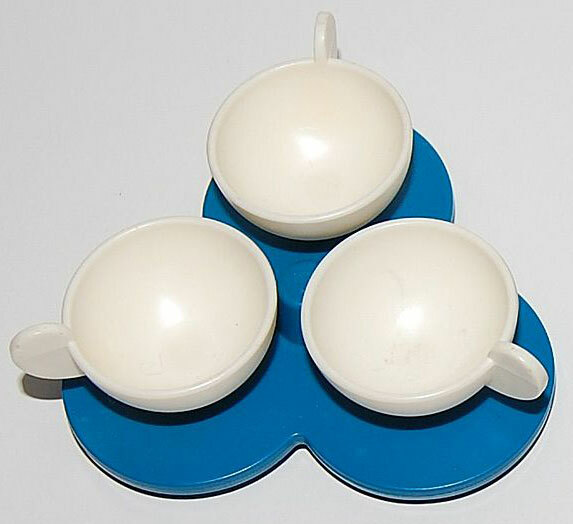 Description: 3 WHITE coffee cups with a handle on the side (handles pointed outward from center), and cups sit on BLUE saucers (molded/merged together). 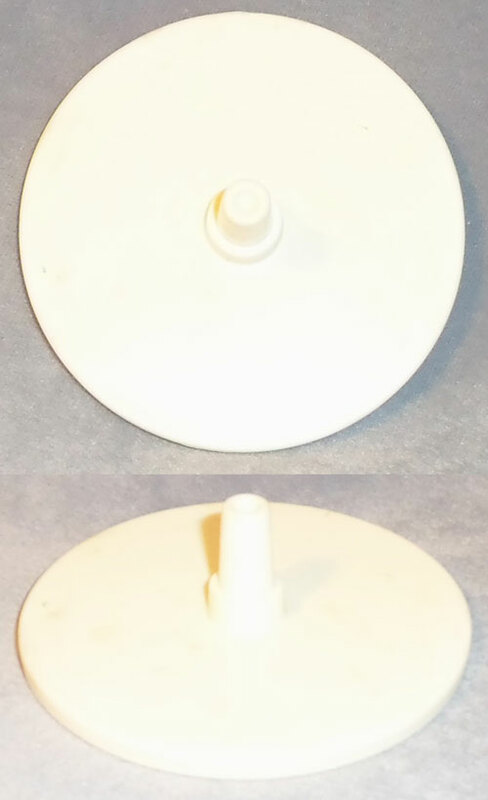 The center of the saucers case has a raised round peg, and a hollow pole on the bottom. The teacup ride fits over a round support base, allowing the ride to spin. Also see HTW414 BLUE coffee cups on WHITE saucers. 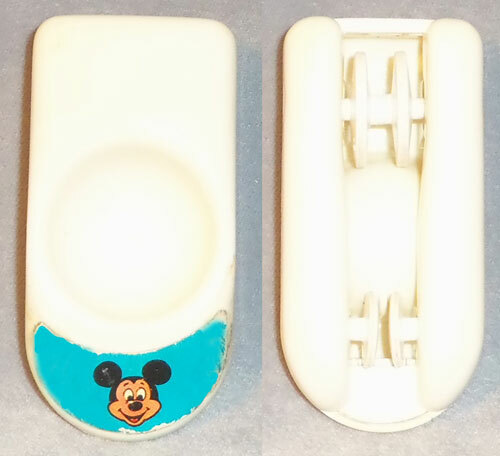 Description: Round white plastic ride base with an upright peg in the center of one side. 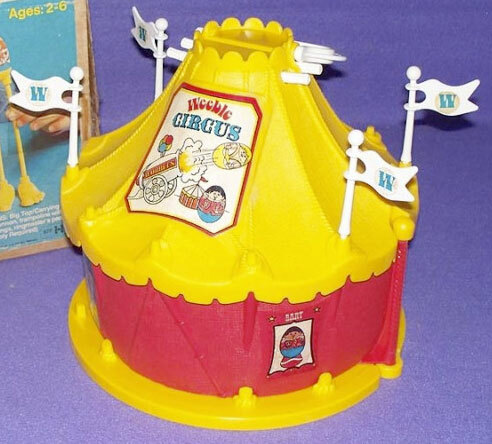 The Flying Dumbo and Revolving Teacups fit on top of this base to spin. Description: Small white plastic monorail car with a rounded recessed "seat" on top. Has a blue litho "hood" with a picture of Mickey Mouse's face in the center. Both long sides of the car have a red litho stripe (often missing). Bottom of car has small white wheels (narrow gap between wheels to fit onto monorail track). Measures 3-1/4" long x 1-5/8" wide x 1" tall. 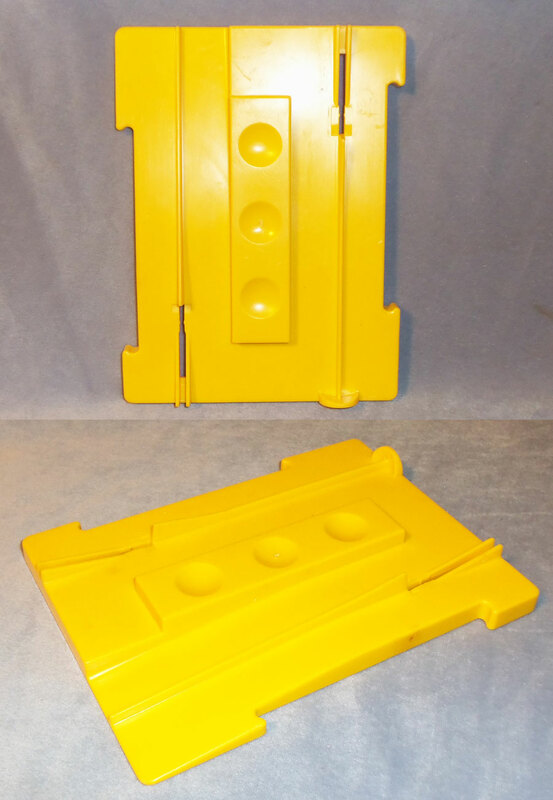 Description: Yellow rectangular "station" (same height and color as the Magic Kingdom base) with a small rectangular recessed area on both sides (front/open Magic Kingdom base fits in rectangular recessed area on either side of the monorail station). The top of the station has 2 monorail tracks with 3 Weeble "seats" (recessed rounded area) in the middle. Monorail track can be attached to station edges. Bottom marked, "143614 - 3". Measures 7" long x 5-1/4" wide. 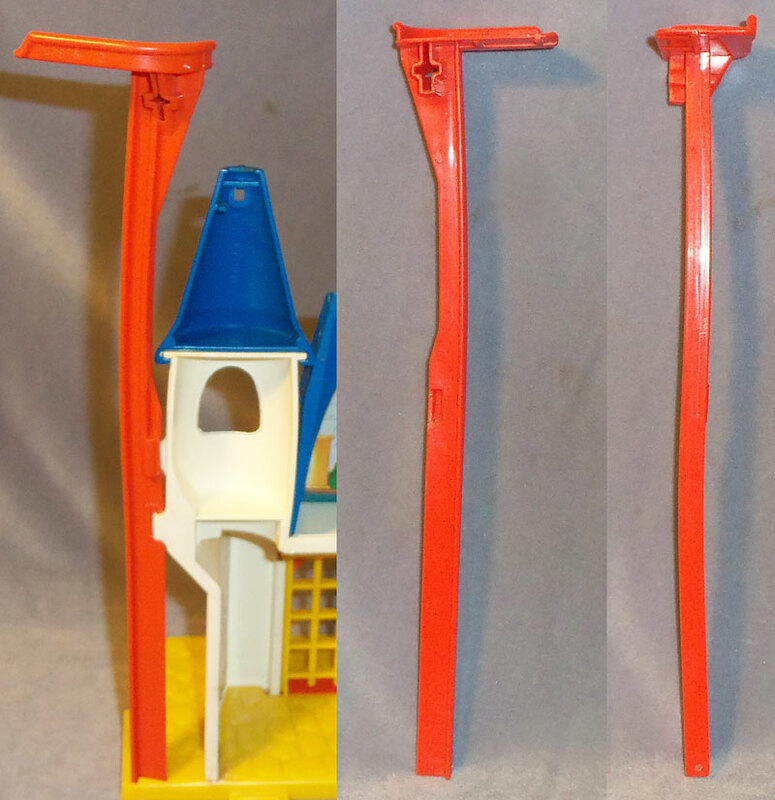 Yellow plastic stilts with a round top (recessed circle for Weeble figure to fit onto) attached to 2 long skinny legs with extra large feet on the end. Measures 6-1/4" tall.